1. Wood Studs — Nom 2 by 4 in., spaced 16 in. OC in each row with studs in opposite rows staggered 8 in. OC. Studs effectively firestopped at top and bottom of wall. 2. Bearing Plates — Nom 2 by 10 in. 3. Gypsum Board* — Any 5/8 in. thick UL Classified Gypsum Board that is eligible for use in Design Nos. L501, G512 or U305. Nom. 5/8 in. thick, 4 ft wide, two layers, applied vertically. Inner layer attached to studs with 6d nails spaced 6 in. OC. Outer layer attached to studs over inner layer with 8d nails spaced 8 in. OC. All joints in inner layers staggered with the joints in outer layers and from joints on opposite side. 3B. Wall and Partition Facings and Accessories* — (As an alternate to Item 3) — Nominal 5/8 in. thick, 4 ft wide panels, secured as described in Item 3. 4. Batts and Blankets* — Min 4 in. thick, min 2.5 pcf unfaced mineral fiber insulation, pressure fit in the wall cavity between studs and plates. 5. 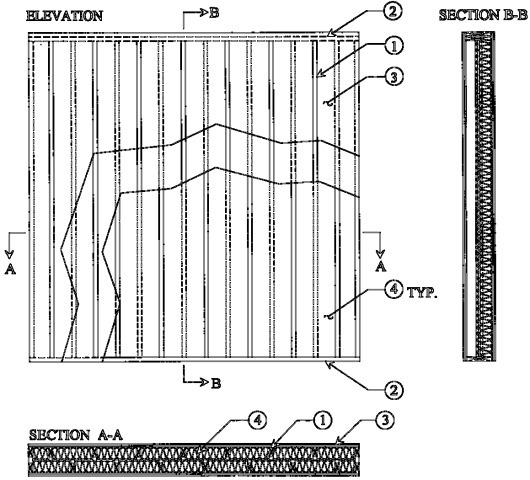 Non-Bearing Wall Partition Intersection — (Optional) Two nominal 2 by 4 in. stud or nominal 2 by 6 in. stud nailed together with two 3in. long 10d nails spaced a max. 16 in. OC. vertically and fastened to one side of the minimum 2 by 4 in. stud with 3 in. long 10d nails spaced a max 16 in. OC. vertically. Intersection between partition wood studs to be flush with the 2 by 4 in. studs. The wall partition wood studs are to be framed with a second 2 by 4 in. wood stud fastened with 3 in. long 10d nails spaced a max. 16 in. OC. vertically. 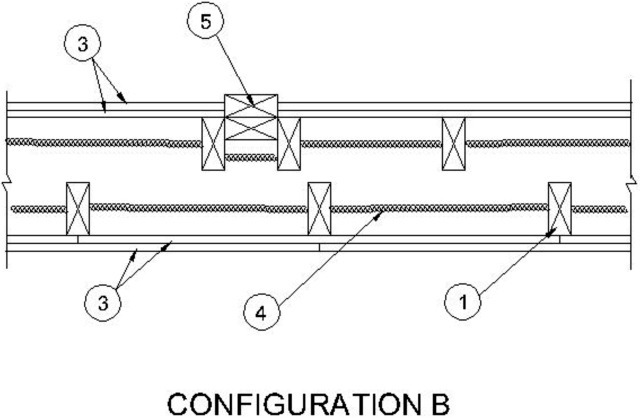 Maximum one non-bearing wall partition intersection per stud cavity. Non-bearing wall partition stud depth shall be at a minimum equal to the depth of the bearing wall.